A million and a half Jewish children under the age of 16 were murdered during the Holocaust. We know very little about them; however, there is one special way to remember them. The “Twinning and Remembrance” concept is to have a Bar/Bat Mitzvah student “twin” and in this way remember a young Jewish person who perished in the Holocaust in his/her ceremony. 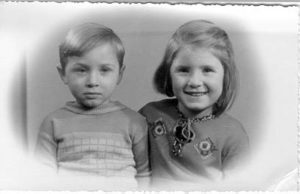 Shown on left in both pictures is Ralph, with his cousin, Esther Posner on right. 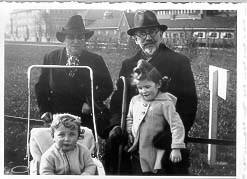 Photo on left shows them with their grandparents in Amsterdam, the Netherlands. Ralph was taken to Westerbrook Internment Camp, where he died in 1943. Esther survived in hiding and currently lives in Michigan, USA. If you wish to twin with Ralph, you can interview Esther and she will tell you about Ralph, about his childhood, his grandparents, and the Jewish world they lived in. The “twin” to be remembered by our Jewish Bar/Bat Mitzvah student can be a member of his/her immediate family who perished in the Holocaust, or never had the chance to become Bar/Bat Mitzvah. Or the twin can be one of the young people killed during this time in Jewish history. This is one way for young Jews to learn about the Holocaust. Ideally, the student will do much of the research in terms of contacting relatives, museums, and websites for names, places, photos, historical accuracy, etc. This process will bring young and older family members closer in a deep, emotional way. Other adults who may help may include interested individuals, camp Survivors or Child Survivors, and Children of Survivors, also called Second Generation. There are several ways to find a twin. A “twin” to be remembered is a victim of the Holocaust. This person may be someone who perished during the Holocaust or an adult who never had the opportunity to be Bar/Bat Mitzvahed because of the circumstances of the War. The adult might be a Child Survivor. The “twin” may be someone who can be identified through sources in the U.S. Holocaust Memorial Museum or our own local Holocaust Memorial Center. There are some books with photographs and brief histories. One such book is Serge Klarsfeld’s The French Children of the Holocaust, a 4-inch thick book that lists all the Jewish children in France who were murdered by the Nazis. There are photographs of the young people, their names and age, where they lived, and what convoy number took them to their deaths. There are other books and numerous web sites that can also offer information. “Twinning” may also occur with any survivors who wish to participate in this religious ceremony. There are those who never had a chance to be Bar/Bar Mitzvahed because they grew up in a non-Jewish environment or were too young or the circumstances of the war prevented any participation in Jewish activities or because females were not Bat Mitzvahed in those times. The Twinning and Remembrance idea or process is about Remembrance and Memory. Eli Wiesel and others have long written about memory and remembrance and what will happen when survivors are no longer with us. How will anyone remember the Holocaust? A bar or bat mitzvah young person wishing to twin with a youngster who perished during the Holocaust allows this young bnai mitzvah person and the whole family and congregation to learn about just one small individual and to remember that young person and the world he or she came from. It’s just one way of passing on our legacy, our memories. Some people do the twinning differently, but the main point of Remembrance is still there, that a young bnai mitzah knows about one young victim who perished and in that way, a young Jew today has made a direct emotional connection to the Holocaust. A young Jewish victim who perished is remembered; our young Bar/Bat Mitzvah person learns about the Holocaust in a personal way. This will then be a significant experience in the student’s life. For more information about Twinning, see our program guide available in PDF format. Click here to download the Twinning Package.